This Friday, New Music in Bryant Park presents another cutting-edge musical performance that pushes the boundaries of genre. This week, JACK Quartet plays in a classical style influenced by experimental, world, electronic, and avant garde music. JACK Quartet will perform its commissioned work "Subject," inspired by the FBI's 1950s era research into the effects of sensory deprivation in humans. Sound deprivation, followed by long or loud sound blasts, altered detainees' sense of time and environment. "Capture shock" techniques like this were used worldwide and not condemned by the international community until 1978. JACK Quartet will use its astounding technique, inventive composition, and fearlessness to explore this idea. JACK Quartet will also play other original works. 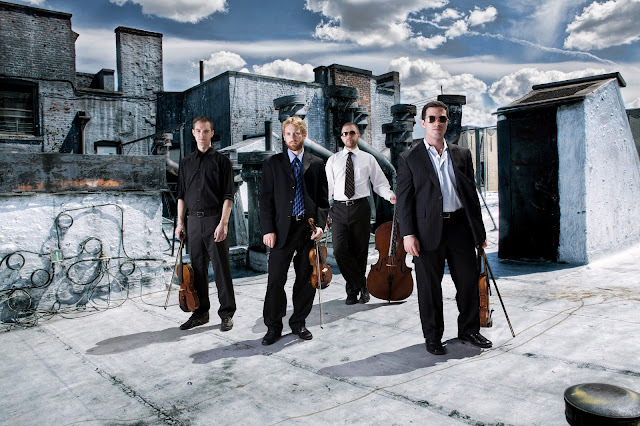 JACK Quartet will push the boundaries of classical music this Friday evening.